Does the mural not belong in a wider sense to the public, to the people who want to see it? I visited San Francisco Art Institute (SFAI) yesterday with my husband and two children in hopes of seeing Diego Riviera’s The Making of a Fresco Showing the Building of a City (1930). I am a lecturer in the Forum for Critical Inquiry at Glasgow School of Art (UK) and have a particular interest in Riviera’s work. In May I visited his Detroit Industry murals at the Detroit Institute of Arts, and in San Francisco I had visited the WPA murals at Coit Tower in preparation for viewing the Riviera work at SFAI. You will doubtless be aware of what happened next. On arrival at the gallery, we found an installation by Alejandro Almanza Pereda entitled Everything but the kitchen sank which was almost entirely obscuring the mural. 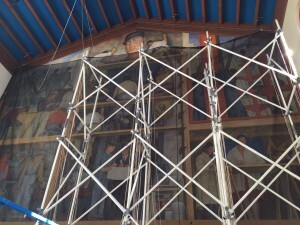 The Harker Award Resident Artist had constructed a 24-foot-high scaffolding of fluorescent light tubes “to contend with and complicate the legacy and monumentality of Diego Rivera’s fresco”. 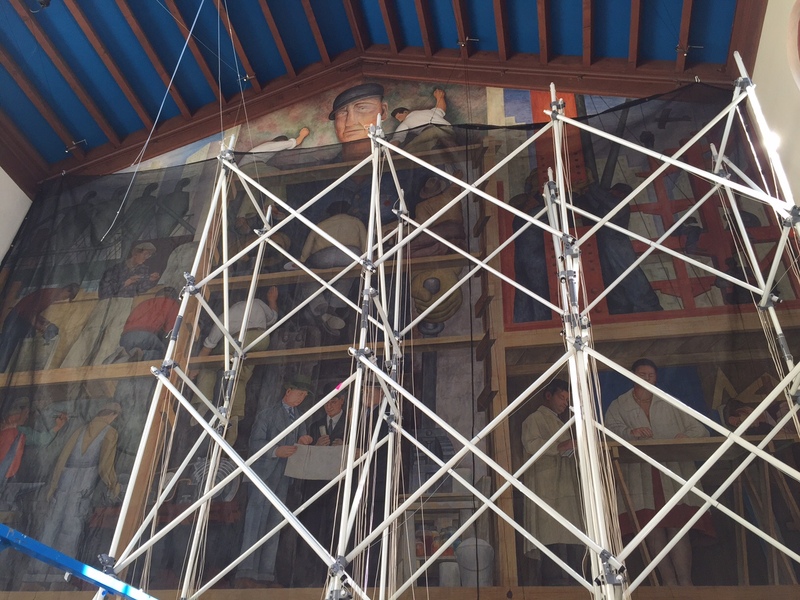 In addition to this, black construction netting has been installed to protect the mural during this process. The postcards provided outside the space describe the exhibit as a “limiting screen” and state that “Through Almanza’s scaffold of fluorescent fixtures, another narrative of historical imbalance, artistic legacy, and the imperious Riveria achieves focus” – but this is not an accurate, clear description. You cannot see the mural. Aside from my real disappointment at being denied the opportunity to see the work, I have serious difficulty with the patronizing quality of the statement on your website, that states “Almanza’s scaffold of fluorescent fixtures doubles the structure of the fresco, shifts Rivera to the middle ground, and troubles the light sensor of the tourist’s camera.” [my emphasis] I am now 39 years old and this is my first visit to San Francisco. I do not know when or if I will have funds or opportunity to return to this city again, therefore this was probably my only chance to see this work in person. Someone working in the space offered me a postcard of the work and said, “You can see it better on this”. To be offered a tiny reproduction of the work to look at when you have made the effort to travel a very long way to see it is just beyond irritating. I have already seen reproductions of the work many times! And by the way, I did not come with my iPhone at the ready to take a selfie at the mural. I did not require my camera’s light sensor problematized: the sole purpose of my visit was to see a unique site-specific work, and to spend time in the space looking at the work. For many people, myself included, this mural is more than an artwork: it is a site of pilgrimage. SFAI may be the custodians of Riviera’s work: but does it not belong in a wider sense to the public, to the people who want to see it? At the least you should add a note on your website stating clearly that the mural will not be fully visible again until after December 12th. As I left the San Francisco Art Institute with my family, I saw another group of tourists arriving, maps and cameras in hand, who were about to be disappointed. I can imagine this scenario being replayed countless times every day for the next six months.